I participated in my first county fair this past week as an exhibitor with Cooperative Extension and the PRISM. We set up our exhibit in the “Ranger Cabin” of the 4-H and Conservation area of the fair grounds. Among us in the area was a live bluegrass band, a history reenactor, an old fashioned Scottish soap maker, a “mountain man”, a blacksmith, and outdoor cooking of delicious cobblers, pulled pork, and stews using Dutch ovens. We were also surrounded by other exhibitors that take part in an effort to conserve different areas of the wild. As far as the rest of the Fairgrounds goes, there was LOTS of food. There were also cows, sheep, goats, chickens, horses, rabbits, and even two reindeer. There were truck pulls, tractor pulls, demolition derbies, pig races, rodeos, and an assortment of children and adults amusement rides. Your typical county fair, I guess. It was an exhausting week as we were there all day every day. We had a very nice set up though, we were in the cabin with DEC educators, and between the two of us we had lots of information about local invasive species. Many people came in very enthusiastic about what we are doing, and what they can do, to help control the spread of invasives. My favorite site for the week was watching the young kids come in interested in a lot of the bug and wanting to know why their bad and how they can help us to stop them. Some kids came in already knowledgeable on the subject of Emerald Ash Borer or Asian Longhorned Beetle, and other kids came in asking questions to us or their parents and genuinely interested in what had to be said. A lot of adults would end up using the cabin as a shortcut, or just look around not really raising much question or interest, so it was really reassuring that the children held such interest in the topic. Aside from the work experience, I spent some time experiencing the fair for myself. Our executive Director, Bill Schwerd, got me out and about trying and seeing some new things. He brought me to the air-soft range where I got to try my hand at using a gun like that for the first time. Following that I took my turn at using a lathe to make a box. That was a really cool experience and I joke with some seriousness that I have found my new hobby. When I return home I will take more time to sand it to perfection before putting a finish on it. Afterwards, I saw my first pig races; how funny they were. My turn at wood turning. The next night I got to experience the 4-H Farmer Olympics. I was only a time keeper for these teams but boy, was it entertaining. Young Farmers in the 4-H program got to make teams of 4 to compete in 4 different events and the team with the fastest overall time, wins. The first race was a wheel-barrel race where the operator was blindfolded with a person in the barrel and the other two teammates had to direct the operator where to turn. It was so funny watching these kids. They ran into hay bales and the posts that held the tent up and kept the crowd laughing with the following events too. Afterwards, I watched a few truck pulls before heading home. The week as as fun as it was tiring. I met a lot of great people and heard many great stories from new friends. This is not my last post yet, that will be next week, but I would really like to thank those that have made my experience at Cooperative Extension here in Saratoga County a great one. I have really enjoyed all the opportunities that have brought me out of the office to meet people in the community. These past 9 weeks have been a lot of fun. 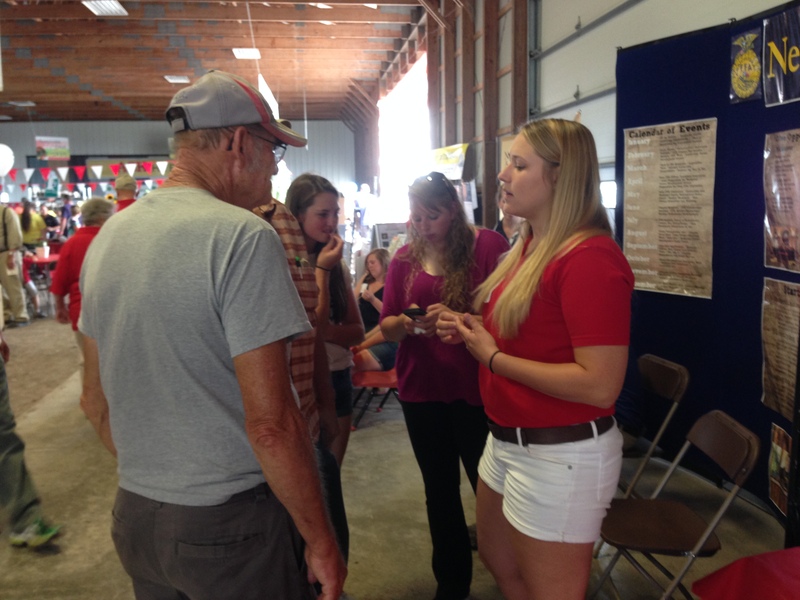 Look out for my last post next Friday about my time with Christina Hall at Empire Farm Days in Seneca Falls informing people and farmers about our project we conducted this summer. By Proclamation of New York State’s Governor, Andrew Cuomo, this week of July 6-12 has been declared as New York State’s Invasive Species Awareness Week. The PRISMs around the state have many events going on to help spread the public awareness of invasive species of their area. Events for this week and in the future can be found at http://www.nyis.info/blog/events/. Some of the ways that I contributed this week to the events was first, on Wednesday, I got to give a presentation to Saratoga County’s Board of Supervisors. That was really exciting. It was a group about about 25 people representing all the different towns that fill the county and it was the first time I had ever had the opportunity to speak to elected officials. I started with an overview of the PRISM and that there are several other PRISMs around the state with similar goals. 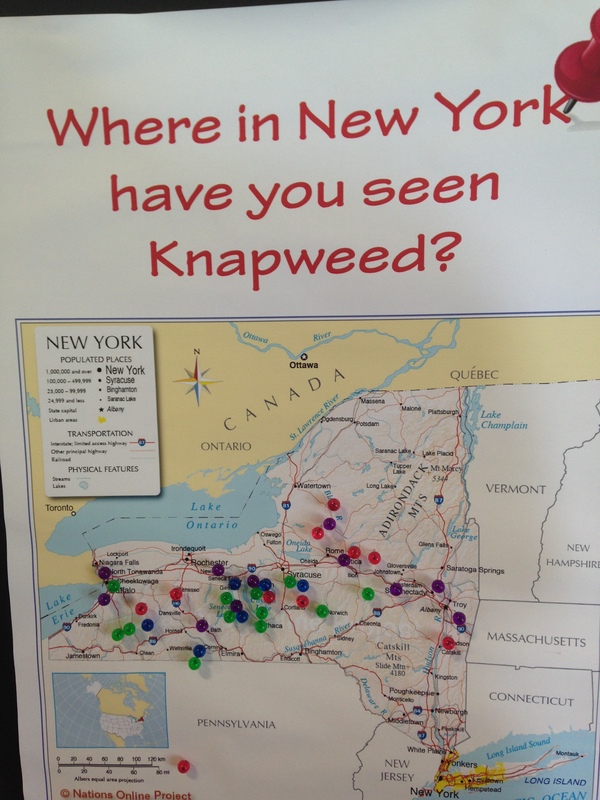 I highlighted where they can find other events for the week and then I got into the brochure I made on common weeds found on Saratoga County farms and I began to talk to them about my project with the Knapweeds. I gave them a highlight of the history and told them what my research from this area would be used for. Lastly, I asked the group if they had any questions for me and I got some response. That was cool because according to Bill, they won’t usually ask questions. Secondly, on Thursday, Laurel and I went down to the New Baltimore rest stop on the Thruway. 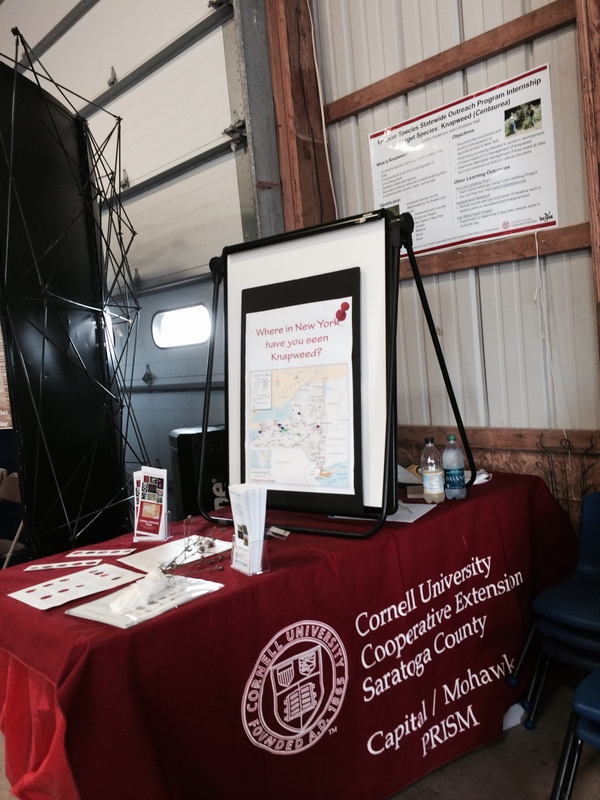 Outside there we set up a information booth about invasive species in New York State. It captured many eyes but only gained the full attention of few out-of-staters that were interested in learning weather or not the same species that were a concern in their states, was also a concern in our state. Lastly, as an educational experience, Laurel brought us up to Lake George to see some of the new boat wash stations around the lake. It was really interesting to see the great effort that is going into preserving and protecting Lake George from the invasive aqua species in other lakes around the state. Even though we did not get to see the wash in action, they walked us through the whole procedure of how they check all the compartment of the boat where water is stored to make sure it is dry and there is not a drop of water in it. If they find any of the invasives, or water still in the boat, they must give it the routine disinfectant, which is just a high-temperature, high-pressure cleaning, inside the bilge and engine, and outside the boat and the trailer. After this I got my first ever visit to Lake George. We checked out the Invasive Species Awareness Week booth set up at the Lake George Visitor Center, then walked around and I got a brief history of the lake. We finished with some soft ice cream before getting back in the car to come back to the office. I am really looking forward to another visit to the area. So it has been over a week since my last post, but there has not been too much to report on until today! Yesterday was an exciting day as Laurel and I headed out to Ithaca to get some training on the project as a whole, and how to identify the species I will be looking for. 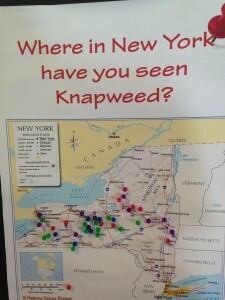 We started discussing the Knapweeds. Jeromy Biazzo, an associate of Lindsey Milbrath – a research entomologist with the USDA-ARS out of Cornell – led a discussion on the history of the different Centaurea species and the objective of locating them across the state. The history begins in 1907 where Spotted Knapweed -though not the only species now present- was first found in Washington state. It spread into the surrounding states of Idaho, Oregon, Montana, and into British Colombia from there. In the 1970’s much work was done on finding biological controls for the Knapweeds. Years of research and experiments allowed the release of nearly a dozen different root weevils, seedhead weevils, and seedhead flies. The three types of insects, when used as a combination, are very effective in damaging the Knapweed to control its spread. Spotted Knapweed and other species, cause severe problems in agricultural systems. They spread uncontrollably because they have the ability to produce tens of thousands of seeds. These seeds can be carried by wind, water, animals, or humans. 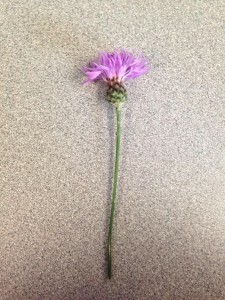 Some species of Knapweed are particularly dangerous because they can produce toxins in their roots that stunt the growth of other plants around them if the other plants are not adapted to this. Knapweed has the ability to become a serious invasive in fields under favorable conditions for the plant. 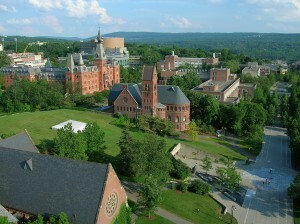 However, the point of the research that Cornell will conduct, is to determine if the Northeast has these favorable conditions for the Knapweeds. As you may have guess, somehow it has found its way to the East Coast and we are on the hunt. New York and the Northeast have a much different climate than that of the Pacific Northwest. First we want to see if it is actually going to cause any harm to agricultural systems and if it ends up doing so, can we control it with the same insects as they have been using to control Knapweed in the other states. 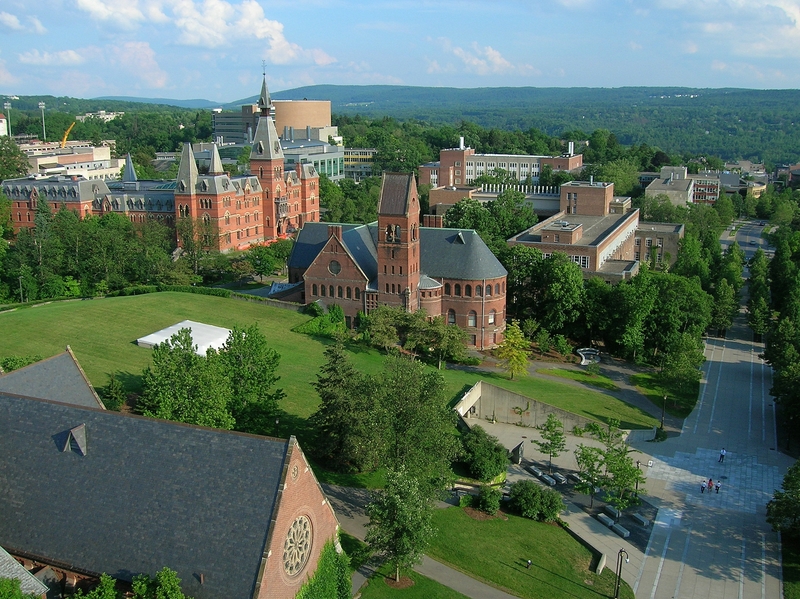 Most of the project is to determine sites and farmers that want to cooperate with the USDA and Cornell to do these studies, and mostly located closer to campus. 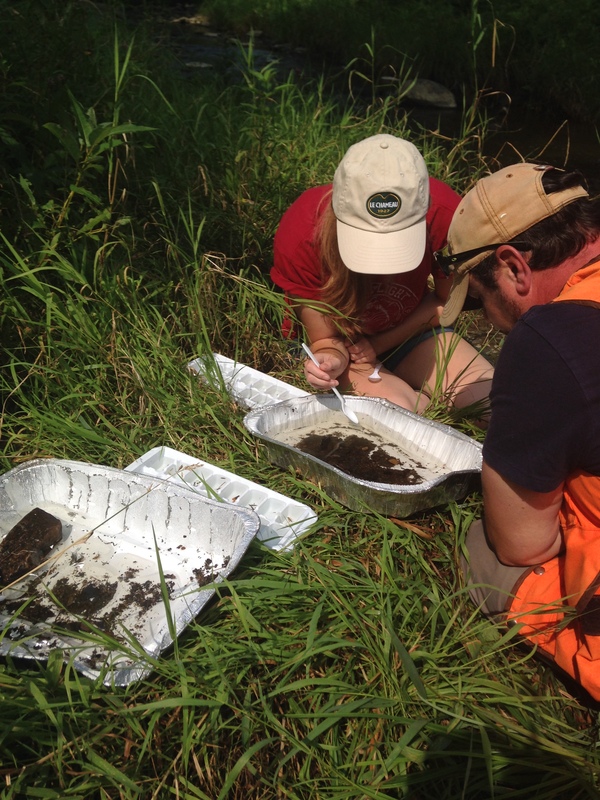 My findings are important for the researchers to know that it is all around the state and what the density of it is. 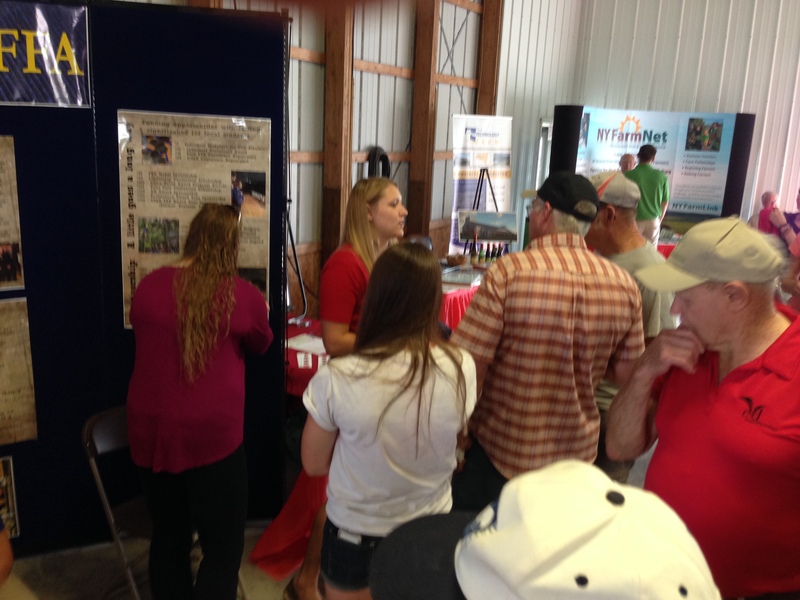 Leslie Allee, a research associate in the Department of Entomology, spoke on the Lady Beetle part of the project. 30 years ago, the nine-spotted ladybug was not only the insect of New York, but found vastly across the Northern part of the US and into Canada. In the past 20-30 years, not a single one has been seen in New York. In an effort to find this native ladybug, in 2005, Leslie and a few other associates launched a citizen science project called the Lost Lady Bug Project, to help them find out what happened to this lady bug. With the efforts of this project, the nine-spotted ladybug has actually been found on Long Island, and it continues to be the only place in New York that has spotted it. Anyone can use the site, the only thing needed is your email address, a photo of the ladybug and the location of where you found it. People uploading this information do not need to be able to identify the ladybug, just take a picture. And it has gotten easier for any smartphone users, there is an app for the project now and you can take a picture and upload it within minutes. It is really exciting and I have been asked to participate in this as well. We also looked at and learned how to identify some species in the carrot family – Wild Parsnip, Queen Anne’s Lace, and Poison Hemlock. We are looking closely at these species because in the past, many lady beetles have been found on many of these species. Given that we are looking for the lady beetle species mentioned above, checking these plants is a great place to start, and the researchers of the lady beetles want to determine if there is some relationship between the bugs and the carrot family of plants. So now with all of this information, and an introduction on how to carry out the protocol, I can begin. The past five weeks, Laurel and I have been making connections with farmers that want to participate and have me snooping around their fields for all that I listed above. We have a list of places that I began my work with this morning. I started at DeVoe’s Rainbow Orchards, a family owned orchard and vegetable operation. John and I searched the large orchard and came up with only some carrot species, fewer species around the second field, but the third field we looked at, BINGO! Spotted Knapweed. Oddly enough, it was a bit exciting to come across some. I really thought that after 2 hours of searching, we might not come up with anything today, but we did. Unfortunately, we did not find any ladybugs, but I will try harder to look for them next time because I have made it a challenge to myself to find either the nine-spotted bug, or the other rare native, the transverse ladybug. Happy Friday all! So it has been a while since my last post and even though I still have not received my parameters for the project I have been hired to carry out, Laurel and I have been finding ways to keep me busy and continuing to learn more about Cornell Cooperative Extension. Represent the needs of agricultural extension field staff to Cornell Cooperative Extension Administration. 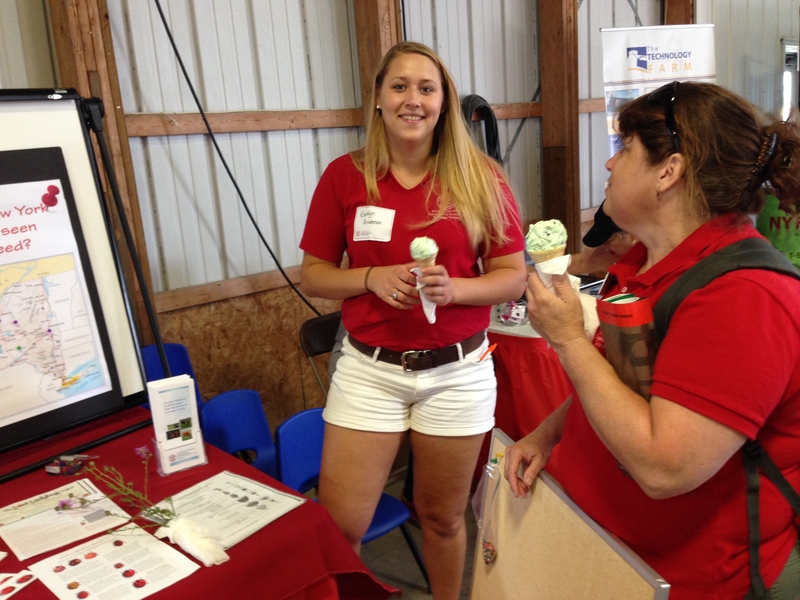 Represent the Agricultural Extension field staff at the state level with organizations such as the NYS Ag Society, NYS Farm Bureau, and the NYS Council of Ag Organizations. Recognize members for outstanding educational programs and innovative field research and provide scholarships to members for professional improvement. Mentor and guide newly hired educators. Host professional development tours and seminars for field staff. This group was the regional Capital District Ag Agents. The tour was really exciting and I am a sucker for anytime I get to hear and learn from farmers about their trades and commodities. Especially if it is something I really know nothing about. We started the morning at O.A. Borden and Sons. They are a sixth generation dairy and orchard business that felt they were struggling and either needed to give something up, or update the business. They looked at their dairy and started with that. They built a brand new specialized barn that houses 100+ of their most productive cows which are milked 2 on Lely robot milkers. They showed us the new facility that was recently opened in November and all agreed that it was their best decision. Since the opening of the new barn, milk production has increased over 10lbs per cow, as well as overall milk quality which has allowed them to obtain super high quality premiums. They say that the free flow of the barn has contributed heavily to this, the cows are less stressed when they have to be taken to a parlor and are free to be milked as they please and allowed to return to the robot as often as they like, however the robot will reject the cow for milking if they have been there within four hours of the last milking. They have not cut down on any of their labor however find themselves finishing morning and evening chores an hour earlier, giving them 2 extra hours in the day to work on other things of importance around the farm. They are also still operating out of their old facility which also houses around 100 cows. The group getting a lesson in vineyard management at Victory View Winery. We moved on from there to Victory View Winery, a member of the Upper Hudson Valley Wine Trail. As a Viticulture/Enology minor and previous vineyard/winery employee of the Finger Lakes, it was very exciting to learn about the Hudson Valley wine market and the types of grapes grown in this region. Most of his varieties lie on 4 acres of his large farm that was previously in dairy production before he purchased it. His varieties include all cold-hardy hybrids such as Marquette, Maréchal Foch, Frontenac, Melody, LaCrosse, and La Crescent. He explained to us his vineyard design and care and wine-making procedures before offering tastings to a few of us in the group. Gerry Barnhardt describing to the group, the wine making process. We moved on next to a composting and topsoil facility, Booth’s Blend Compost. This was exciting because I have ever only been to one composting facility through my time at Cornell compared to the countless dairies and wineries I have experienced. This facility started as a backyard project to compost the dairy farmer’s manure 15 years ago. A few years ago, his age and health made him choose between his own dairy and the composting business. Since then, he has been able to put a lot of time and energy into creating a quality compost for gardeners, landscapers and homeowners in the capital region. Demand grows rapidly though word of mouth advertising and neighboring farmers are also using the facility as a way to get rid of horse, cow, and fair manures. People can pick it up by the bucket or truck load, he also has the compost available in bags that he sells to local nursery and garden centers, as well as a delivery business. Currently they have an extensive wait list. Lunch followed the visit to the compost. We ate a real lunch followed by ice cream at a local ice cream shop, the Ice Cream Man. Here we has a nice round table discussion to hear what all the different extension and Ag Agents are doing in all the capital district counties. It was a great way to learn the different jobs that CCE has to offer and the different outreach they make available in their areas. 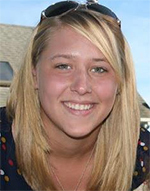 Young Ag Agents are especially educated in ways that they can do their jobs differently just by hearing the different suggestions offered by those with more experience. The last stop on the tour was a brand new Farm Brewery, Argyle Brewing Co. This was probably the most educational experience for me the whole trip. I had never been to a craft brewery and do not know much about the brewing procedure. The biggest take away I got from the visit though was learning about the Farm Brewery Act passed here in New York State last year in 2013. This allows small craft breweries to operate under fewer restrictions than a microbrewery, and does not require the initial capital that other licencing may. This, if you haven’t already noticed has allowed more and more craft breweries to pop up all over New York. One of the most interesting things about the new legislation is that right now, it requires that these farm breweries have 20% of their grain and hops grown in New York. It can be processed anywhere and made into malt, but it must be grown in New York. By 2017, this number will increase to 40%, and 90% by 2023, 10 years after the legislation was passed. Not only this but I have noticed a lot more focus on hop and grain research coming out of Cornell about producing better grains because barley especially does not do well in the wet, cold climate of New York. It does much better in the Midwest. Brewing is going to be the new boom to New York State agriculture. Many people that enjoy beer and have a passion for making their own, are starting breweries all over the state. Some farms, such as Sanford & Sentz, had other professions, in this case dairy, and decided with the new opportunities to give it up and start a brewing business. More and more of this is probably going to be seen across the state and more and more hop and grain growers as well, and rightfully so. There is going to be a very rapid increase in demand for grain and hops in the next ten years, it is going to be really exciting to watch this industry take off. Just another reason, I love NY! This past Sunday was Saratoga County’s 19th annual Sundae on the Farm held at Welcome Stock Farm. It is an afternoon event to celebrate agriculture in the county and it takes place every Father’s Day on a local farm. The farm offers tours of their production, there is food, ice cream provided by Stewart’s, pie a la mode from Smith’s Orchard Bake Shop, local cheese, maple syrup, and other vendors and exhibitors, live animals, and music. The event is organized by the local town, Cornell Cooperative Extension, Saratoga County Farm Bureau, and Saratoga County Agricultural Promotion Committee. Fifty years ago, Saratoga County had approximately 1,000 farms. Today that number had dwindled to just over 500. Land in agricultural production has decreased as well, from 139,000 acres to 78,000 acres across the county according to the USDA Census of Agriculture. As sad as this may sound, there is good news from these changes. The most recent census shows that since 2007, farmland has increased as a total and on a per-farm basis. Market value of these farms’ crops and products has also increased, and the number of principal operators as a primary occupation has increased, meaning that there are now more farmers in the county. Farms are more efficient now than they have ever been due to rapid improvements in technology and research. Because of this, we can have fewer large farms and we do not need a lot of little farms. However, this lessens the number of everyday farmers we find in our communities and further distances the relationship everyday consumers have with their food as these large farms get pushed out of the city limits. Sundae on the Farm is just one of the ways this county excels at strengthening that relationship and encouraging people to come to these farms and learn about the processes of where their food comes from. Saratoga county is also a big agro-tourism community where people can often go pick their own fruits and vegetables at local farm-stands, re-enforcing the connection people have with their food. This was my introduction to educating everyday people about invasive species and giving them the resources they need to be able to identify them and report issues with some of New York State’s worst species. Some of these species are those that I won’t even be dealing with. I had to quickly catch on about the Emerald Ash Borer, the Asian Longhorn Beetle, landscaping invasives, and so on. It was good to see the interest much of the community had in trying to stop these pests before they began to lose the plants and animals they had. Many people picked up the brochures I had made to use as a guide this summer, so that was exciting for me, to see my materials become a helpful guide to stopping the spread of invasive landscape ornamentals and agricultural weeds. I made it through my first week, learning a lot on the way. The biggest thing I am starting to figure out, is that I need to be prepared for anything I might be doing on any given day. I especially got this on Thursday. I woke up Thursday morning looking at a rainy forecast, knowing I had a substantial amount of office work to do from recording the invasive species on the perimeter of the 4-H Training Center from the previous day, and I knew there was a conference call I would be sitting in on in the afternoon. So I decided to look nice and dress for the office and threw my boots in the car just in case we went out to a farm or something. Well, John (a fellow intern), Laurel, and I did end up in the field for part of the early afternoon. One of the mapping technologies we are using to record invasive species we find is a program called iMap Invasives, and there was an entry from the National Grid of Mile-A-Minute vine along some power lines not too far from us. Because this could be the first sighting of this vine in the county, we decided to head out just to make sure, because if it turns up, it is going to be a major one we are going to need to keep an eye on. We made it out to the first location with the recorded coordinates and there showed no sign of the vine. We then walked another ~half mile or so to the second location. Along the way we noticed that the ground these power lines run across is not actually dry land, but very wetlands. I was in my boots, fortunately. However, my pants, my only nice pair of khakis, were not so lucky at times where the water got fairly deep. The pants ended up with some black mud on the bottom of them but I trudged along though because I am not going to allow my unpreparedness in the field to get in the way of my job. After all of this though, we made it to the second location, and there was also still no sign of Mile-a-Minute and I learned that maybe just my boots is not the only change of attire I am going to be needing this summer. Saturday I went out to the 4-H training center again, where I assisted John and his project in the morning. John, in collaboration with CCE and the New York Forest Owners Association (NYFOA), have decided to create a deer exclosure to monitor deer damage in the forest. This information will also be useful for homeowners to see how easy it is to get the materials needed to install a fence to prevent losses in their own gardens. The deer exclosure is a 1000 ft. enclosed area with an 8 ft. high fence with posts made of both rebar and 2×2 boards. The control is an area of equal size marked adjacent to it. The observation will take place over a few years to show that deer have a major impact on tree sapling growth on the forest floor. The past few days I have also been working on a brochure – Gardening Native Plants-for alternative native species of plants that homeowners can plant instead of/ or in replacement of popular invasive plant species in their gardens or landscapes. Some of these invasives include Burning Bush, Japanese Honeysuckle, Japanese Barberry, or Oriental Bittersweet. I spent some time making a public handout that would help people recognize these invasives and give them an idea of what would be a similar alternative that is just as beautiful and has less of a lasting impact on the environment and economy. (Click the link above to see what you may have in your garden). Last thing I want to discuss is my project descriptions. Yes, plural. They are definitely keeping me very busy here. So far what I gathered is that I will be mapping invasive plant species encroachment on agricultural fields around Saratoga County and some of the surrounding counties that lie in the Capital/Mohawk PRISM (Partnership for Regional Invasive Species Management). The state is broken in to 8 of these PRISMS – the Capital/Mohawk, Lower Hudson, Long Island, Catskills, Adirondacks, St. Lawrence, Finger Lakes, and Western NY. My work will focus in this PRISM, while similar observations will be taken in the Finger Lakes PRISM by a colleague/classmate for the same purpose. All of it will be analyzed by Toni DiTomasso, a weed science professional at Cornell, and released to the PRISMs from which the data was collected. All invasive information will be entered into the iMap Invasive program. A thing I have been asked to keep a look out for and inventory their locations and densities, is Common Milkweed. As many may know, the Common Milkweed is a major weed in many agricultural fields but at the same time, a major vector for agricultural pollinators. The Monarch Butterfly, a near threatened species, lays their eggs on milkweed, and with the dying population of milkweed due to herbicides in many fields, the butterfly population is also dwindling. I will be noting the milkweed locations and entering them into a project separate from my invasive species in iMap Invasives. Starting tomorrow, John and I will be shaking out hay bales for seeds that may be from invasive species. We will germinate any seeds we find to determine what species it is and not only if it is a pest to farmers, but is it harmful to horses as well. We have samples from out of state hay farms as well as a local control to see what we could potentially be bringing into the area that does not belong here. Saratoga is a largely populated area for horses and not all horse farmers grow their own, so many will buy it in from other areas. Is what gets brought in harmful to horses in any way? And will it be adding to the large inventory of invasive species to the area? My name is Kaitlyn Anderson. Today was my first real day as a Cornell Cooperative Extension intern inventorying invasive species. After a few weeks of getting my paperwork together as fast as I could, I went through a brief orientation with my supervisor, Laurel Gailor, yesterday, and today I was able to go out into the field with her and meet some of the local farmers of Saratoga County. We traveled to a number of orchards, learning about farmers’ main weed problems and concerns. I learned to use the equipment (GPS and data sheets) and methods for recording my findings. It was a productive day making local farmer connections, getting permission to use their fields, and orienting myself with the area. I am looking forward to learning a lot, very quickly. I do not have any experience working with weeds or how to even identify what would be an invasive weed species. I am getting to know the Extension staff and am looking forward to a beautiful summer in Saratoga County.